Joachim Fritz Krauledat was born in Tilsit, East Prussia, Germany, in 1944. His father, Fritz, was killed in the war the month before his birth. In 1945, Soviet troops advanced across what became East Germany. His mother fled with him in what the child recalled as “a daring nighttime escape” into what became the British occupied zone to Hanover, West Germany. Young Joachim was influenced by British newsreels of the People’s Uprising in 1953 in East Germany. The uprising took place three months after the death of Soviet leader Joseph Stalin, on June 16-17, 1953. It involved over a million people going on strike across 700 towns and cities. The uprising was crushed by 20,000 Soviet soldiers and 8,000 East German police. Joachim was also stirred by the Hungarian Revolution of October 23 to November 10, 1956. Joachim Krauledat moved to Canada in 1958. In the early sixties he was influenced by the folk music revival and attended the Newport Folk Festival in 1964 and 1965. He heard Bob Dylan, Phil Ochs, Richard Farina and others. By 1965, Joachim Krauledat had become a musician and joined the Ottawa blues rock band The Sparrows, billing himself as John Kay. That fall, The Sparrows opened for Gary Lewis & The Playboys in Toronto’s Massey Hall. The Sparrows got regular gigs in Toronto, New York City and also performed on Long Island. They moved to California in November 1966 and shared the stage in San Francisco with The Youngbloods and Moby Grape. The Sparrows spent time in San Francisco’s Haight-Ashbury district and then moved to the Sunset Strip in L.A. By 1967 the group altered their name to Sparrow and performed alongside The Doors and The Steve Miller Band. In late 1967, Sparrow changed their name again, this time to Steppenwolf. The band’s name was inspired by the tenth novel by Hermann Hesse. The novel, Steppenwolf, is a discourse on a man, Harry Haller, who believes himself to be of two natures: one high, the spiritual nature of a human “man”; The other is low and animalistic, a “wolf of the steppes.” Harry Haller is entangled in an irresolvable struggle, never content with either nature because he cannot see beyond this self-made concept. And so Sparrow’s choice to name themselves Steppenwolf appealed to an intellectual element in the youth counter-culture of the late ’60’s. In 1968, Steppenwolf had a huge hit titled “Born To Be Wild”. Originally, “Born To Be Wild” was written as a ballad. Only as the band rehearsed the song did they experiment with heavier rock n’ roll guitar and speed up the tune. And Dunhill-RCA Records wanted “Everybody’s Next One” to be the A-side. After a struggle between the record company and the band, it was agreed to release the single without assigning an A-side or a B-side and let the radio stations decide based on listener response. “Born To Be Wild” was featured in the countercultural film with Peter Fonda and Dennis Hopper titled Easy Rider. It climbed to #1 in Vancouver and #2 on the Billboard Hot 100 in August 1968. The group had a followup hit in the winter of ’68 with a song John Kay penned titled “Magic Carpet Ride”. In 1968, Steppenwolf appeared in concert alongside The Doors, Canned Heat, Sonny & Cher, The Grateful Dead, The Byrds, Santana, Sly & The Family Stone and Iron Butterfly. They had one more crack at the Top Ten in 1969 with another song Kay wrote titled “Rock Me”. Between 1969 and 1971 Steppenwolf performed in concert and shared the bill variously with Jimi Hendrix, Joe Cocker, the Byrds, Creedence Clearwater Revival, the Rolling Stones, Janis Joplin, Chambers Brothers, Sly and the Family Stone, Jefferson Airplane, the Byrds, Spirit, Pacific Gas & Electric, Country Joe and the Fish, Johnny Winter, Led Zeppelin, Frank Zappa, Paul Simon, Donovan, Grand Funk Railroad and King Crimson. But they tried to crush his spirit ’til his conscience ruined their plans.” Before the band split in 1972, Steppenwolf had released six studio albums and two live albums. In 1972, John Kay went solo. He had a minor hit with “I’m Movin’ On”. The single climbed to #12 in Salt Lake City, #13 in Los Angeles, #15 in Montgomery (AL) and #23 on CKLG in Vancouver. The song peaked at #52 on the Billboard Hot 100. 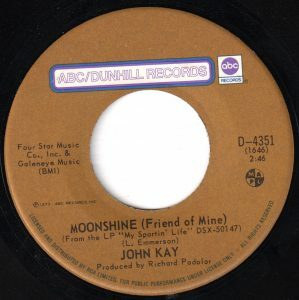 A follow up single was “Moonshine (Friend of Mine)”. “Moonshine (Friend of Mine)” climbed to #4 in Ottawa and #5 in Vancouver. Its next best chart performance was at #20 in Windsor, Ontario. 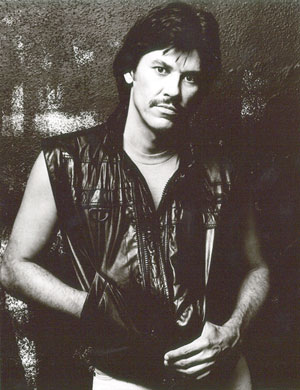 The song was from John Kay’s solo album, My Sportin’ Life. Kay’s final foray into the pop charts was with “Easy Evil”. His followup to “Moonshine (Friend of Mine)” managed to climb to #12 in Kansas City and #18 in Seattle late in the summer of ’73. In an article titled “Is Your Friend ‘Sleep It Off’ Drunk Or ‘Call 000’ Drunk?,” Beth Skwarecki writes that one “big danger to a drunk person is trauma, especially head injuries. Someone can fall because alcohol makes them clumsy, then get up again because alcohol dulls their response to pain. If you see blood, bruising, or swelling, especially on someone’s head, that could signify a serious injury.” So the character described in “Moonshine (Friend of Mine)” is quite likely in trouble as they are anticipating that they have little control of their own sense of balance. Steppenwolf had a reunion in 1974. In part, this was prompted by the poor sales of Kay’s two solo albums in 1972-73. The band released three studio albums between 1974 and 1976. While Slow Flux peaked at #47 on the Billboard 200 Album chart, successive album releases reflected declining interest in Steppenwolf’s new material. Kay disbanded Steppenwolf in 1976, but reformed the band in 1980. They released a live album in 1981 and studio albums in 1982, 1984, 1985, 1987 and 1990. On July 28, 1991, Steppenwolf appeared at what was billed as a Psychedelic Celebration in a Chicago suburb along with Three Dog Night, Dave Mason and Arlo Guthrie. Steppenwolf was invited to perform at the International Hermann-Hesse-Festival 2002, in the German city of Calw in the Black Forest. The city was the birthplace of Hermann Hesse, and concert-goers were stunned to learn that John Kay spoke German and was born in East Prussia (now Sovetsk, Kaliningrad Oblast, Russia). Steppenwolf performed at what was billed as a farewell concert in 2007 where Aretha Franklin also headlined at the Chesapeake Bay Blues Festival in Annapolis, Maryland. Steppenwolf performed numbers of concerts throughout 2011 to 2018. On October 24, 2018, John Kay wrote on the Steppenwolf website that the band performed their final concert on October 14, 2018. This was fifty years after Steppenwolf climbed up the charts with “Born To Be Wild”. Kay reflected that Steppenwolf was fortunate to have been able to perform in all fifty states in the USA on multiple occasions, as well as nine Canadian provinces and twenty-one other countries. In 2004 John Kay and Maue Kay created the Maue Kay Foundation to advance the protection of wildlife, the environment and human rights. They helped support an elephant sanctuary in rural Tennessee that was established in 1995. The sanctuary provides 2,700 acres for ten elephants retired from circuses and zoos to care for the elephants. The Maue Kay Foundation also supports Orangutan Foundation International and their work to protect orangutans in Borneo. CKLG Boss 30, CKLG-AM 730, Vancouver, BC, August 23, 1968. John Kay, It’s Been A Hell of a Ride, Steppenwolf.com, October 24, 2018. The Elephant Sanctuary, Maue Kay.org. Tim Ghiani, Life’s Been A Wild Ride, The Tennessean, March 20, 2005. Lee Zimmerman, Singer John Kay Perseveres with Steppenwolf, Goldmine Mag.com, June 14, 2018. Beth Skwarecki, Is Your Friend ‘Sleep It Off’ Drunk Or ‘Call 000’ Drunk?, Lifehacker Australia.com, January 12, 2016.